Prostate 2.4 is a dietary supplement that aims at promoting prostate health. The manufacturer proudly states that the formula was designed by urologists with the goal of assisting you in maintaining a healthy prostate. The supplement first appeared in 2003, but the formula was perfected over time for optimal benefits. 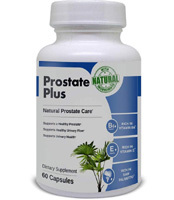 The product promotes regular prostate cell growth and can play a role in supporting tissue health. Essentially, Prostate 2.4 is a formula with natural ingredients and nutrients necessary to support the long-term health of your prostate. Who is the Manufacturer of Prostate 2.4? The manufacturer of Prostate 2.4 is a company that has the name Theralogix. As they emphasize, one thing is their priority – providing an effective choice to customers in times when they can pick from an endless selection of supplements. The company aims to stand out with quality and health product that emphasize a specific area of general health and wellness. Theralogix was founded in 2002 and has manufactured a total of 30 products over time. How Does Prostate 2.4 Work? 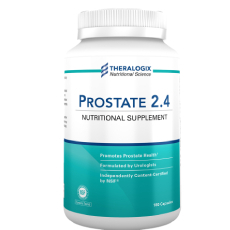 The working process of Prostate 2.4 is largely based on nutrients the formula contains. The manufacturer claims that only the necessary nutrients were included. Several ingredients, such as vitamin E and lycopene work on preventing and dealing with inflammation while the ingredients also help to protect your body from oxidative damage, which keeps your prostate cells from further deterioration. Prostate 2.4 is actually a part of a system designed by the same manufacturer. Theralogix also makes Prostate SR and Prostate PQ and these three can be combined depending on your health necessities. Prostate 2.4 Ingredients – Are they Safe & Effective? Vitamin D3 – Also known as cholecalciferol, it is vital for bone health. It can work on preventing fractures and osteoporosis and boost both physical and mental performance. Vitamin D also encourages optimal sleep patterns and reduced heart disease risk. Vitamin E – This compound is known for its antioxidant and anti-inflammatory characteristics, which can lead to a reduction of inflammation markers and help to deal with joint pain. Selenium – A mineral that can have several benefits for our health, including treating inflammation and promoting the immune system to fight infections. It also works on reducing stress, as well as optimizing the function of thyroid gland. Soy – It is believed that soy isoflavones included in this product can help to deal with fatigue and symptoms of osteoporosis. Soy promotes bone strength and assists in reducing tiredness, but it may cause allergic reactions for some consumers. Gamma Tocopherol – It is a particular form of vitamin E that is often mentioned to have admirable absorption and multiple benefits. It can do a solid job in protecting the body against oxidative stress. Lycopene – This is a pigment that gives tomatoes and other fruits their red color. It has anti-stress and neuroprotective properties and can also help in preventing muscle injury and inflammation. The inactive compounds included are silicon dioxide, magnesium stearate, rice flour, and gelatin, which is a BSE-free bovine gelatin. What are the Advantages of Prostate 2.4? What are the Disadvantages of Prostate 2.4? The company recommends taking two pills of Prostate 2.4 daily. Make sure to take them with food, but you can choose whether to consume them at once or spread the dosage. The retail price of Prostate 2.4 is set at $106 per bottle. However, if you have a code from your healthcare provider, you may take advantage of the preferred customer price (PRC) which is set at $90. The return policy is valid for 30 days and you are eligible for a refund as long as the product is unused and unopened. Even if the 30 days had expired, you can return Prostate 2.4 and receive store credit. However, keep in mind that the shipping charges are not refunded. Does Prostate 2.4 Offer a Free Trial? No, it doesn’t seem that the manufacturer offers a trial deal at this moment. Prostate 2.4 is a dietary supplement that aims to promote general prostate health. However, keep in mind that it might not provide immediate relief since the focus is placed on long-term benefits. The supplement works on dealing with inflammation, but due to high amounts of vitamin D, it may be wise to consult a doctor before using it. That way you can be sure that you need the extra dosage of this vitamin provided by Prostate 2.4. The product also works on protecting the prostate from oxidative stress, but it may cause allergic reactions in those allergic to soy. Also, for optimized effect, you may need to combine it with other products by the same manufacturer. While you are here, we suggest checking out other prostate products reviews. There are so many best supplements for prostate out there and you want to do everything in your power to make the right choice for the purchase.